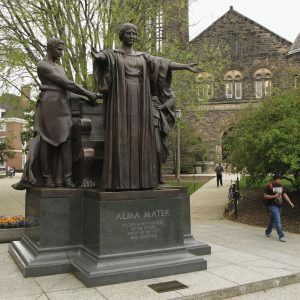 The Alma Mater statue on the University of Illinois campus. I was really truck by the eloquence of Lynn Freehill-Maye’s New York Times’ travel piece on David Foster Wallace’s life in Champaign-Urbana and Bloomington-Normal. It has been seven years since I last drove through Central Illinois, and it was early winter by temperature, snow flurries and the wind buffeting the car from every direction but mid-November by calendar. She was writing about “the flatlands” and Wallace in early spring. It had been decades since I graduated from the University of Illinois an remembering how many great and talented people I met there and stay in touch with [wish there were more]. She really captured the strange attraction of that land where county extension agents insist and boast the glaciers deposited all the best top soil from Canada to the land along the 220-mile, Interstate 74 corridor between Danville on the Indiana border to the Quad Cities on the Mississippi River. I learned how to speak American English in Chicago with its curious words, pop for soda [or coke in Baltimore for any soft drink], etc., and accent. After I got out of the Air Force, I had the wonderful good fortune to teach for four years at a Penn State branch campus in Sharon, about halfway between Cleveland and Pittsburgh where I learned another version of American English with yunzz [for yu’uns] for you or you all in most of the South, and its own accent. Have the American Regional Dictionary — a treasure, but am really looking forward to checking out Ted McClelland’s new “How to Speak Midwestern.” Having lived in Virginia for 40 years, with almost a decade in Tidewater, my accent has eroded.